Let Technology Do the Work for You! Don will be recording this event in his efforts to create the 2013 edition of his home study course and will be including the iPad Boot Camp as part of his training material for the very first time. Come join us and be part of this historic event and home study course. 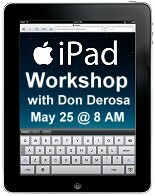 Don will teach you how to fully leverage your investment in mobile devices! Do you have a an iPad, tablet, iPhone or smart phone that you’re using for Angry Birds or Words with Friends, maybe email, but not much else? Don uses the iPad exclusively to run his Real Estate Investment business… and you can too! Take your business with you where ever you go; have all your comp’s, photos and forms right in your palm!!! Leverage all of your mobile devices to make you the most effective, competitive, profitable real estate investor you can be. Yes you can “print” to your iPad. Send the sale contract to the lawyer for title search while you’re still at the seller’s home. 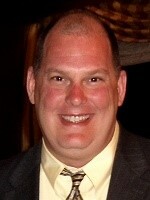 Don will demonstrate his “Exclusive Property Evaluation Tools” as well as the app’s he uses to run his business. Are you afraid to make a deal because you might lose money? Want to buy a rental home, but not sure if you’ll net the $300 you want to each month? Now your decision is as easy as Green means ‘Go’ and Red means ‘No!’ When it’s Green, you can feel confident that you’ve got a $20,000 profit waiting for you. Don’s unique Property Evaluation Tools, the Easy Offer Maker and Cash Flow Evaluator, do the evaluation work for you. Don will teach you how they actually can do the negotiating for you, too! No more sweaty palms worrying that a seller will kick you out because they’re insulted by your low offer. No more racing heart wondering if they’ll accept $4,000 even though they want $40,000. They’ll see that you’re working on their behalf to get them as much of their equity as you can. You’ll both feel good. It’s the definition of a Win-Win. You’ll easily evaluate Buy, Fix and Flips, Buy and Holds, Wholesale Lease Options and Sandwich Lease Options. RETRACTION: The prices for this class were printed incorrectly in The Profit Newsletter May edition on page 3. The correct prices are $79 for Gold Members, $149 for Silver Members and $199 for Non-Members. We honored the lower prices through midnight on May 6, 2013.